Specialty EMR – Is it the future? Over the past few years we witnessed lots of developments in the healthcare industry. Although EMRs have been around for as long as 40 years, but it was not until a decade ago that EMR adoption finally gained some momentum. Although the previous administration started laying the foundation for EHR adoption, President Obama made the drizzle into a torrid that swept the medical community off its feet! With the introduction of the American Recovery and Re-investment Act (ARRA) and the CMS incentives; providers, vendors and investors all jumped on the bandwagon of Electronic Medical Records. However as they say partying hard makes your crash harder; providers started to realize the problem with going all in; although EMRs had come a long way both in features and usability, complete shift from paper to the detailed functionality of a modern EHR is quite overwhelming. Though established vendors realizing the situation did act to provide bewildered practitioners with somewhat customizable templates, a lot still felt hapless as they forcefully tried to shape their practice to adapt to its EMR or “the way of the EMR”. However dark clouds must part! In this evolutionary age of technology and opportunity, vendors began to develop specialty EHRs; more advanced and focused templates to provide specialists with the right tools the very least. Specialty EMR’s provided much relief to specialist groups such as dermatologists (early targets) providing advanced specialty templates to allow quicker information entry and workflow, customization to enforce best practice guide lines and pre-defined data captures. Specialty focused EMR has definitely helped in making workflow more targeted to everyday tasks and there yet be more to come as vendors continue to develop advanced applications to remain competitive in this cut throat market. In today’s health care industry, Electronic Medical Records (EMR) with Patient Portals have become the need of the hour for many forward thinking medical practices. EHRs allow health care organizations to improve outcomes by providing proficient medical service, while patient portals typically provide communication services between patients and providers – substantially improving patient satisfaction and the value of services delivered by medical practices. These features can be prioritized based on patient needs, resource implications and organizational goals. Online medication renewals, referral requests and basic scheduling require moderate resource commitments from operations, and can easily replace less efficient processes. A patient portal delivers vital care information directly to the patient’s desktop to help enhance customer satisfaction, eliminate preventable errors along with better care collaboration between doctors and patients. 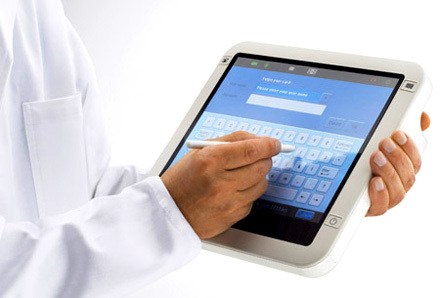 The real-time collaboration between patients, providers and referring physicians through the patient portal allows clinicians and their patients to share healthcare information in a highly secure, HIPAA compliant environment through the use of SSL and access control patterns whilst, patient access is also typically validated with a user name and password. 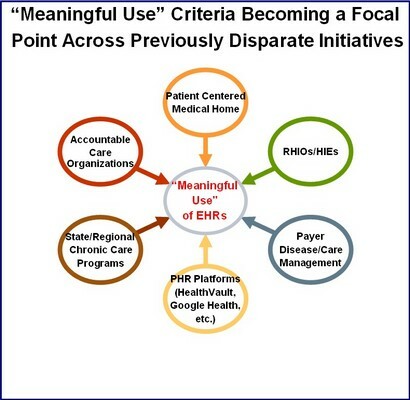 Patient portals are also a key tool for physicians to meet “Meaningful Use” requirements and receive federal incentive checks, especially for providing health information to patients. Popular patient portal applications enable patients to register and complete forms online, which can streamline visits to physician clinics and hospitals. At present, individual health information is located primarily on paper. However, it is predicted that more than 75% of hospitals around the country will be utilizing this technology by the end of 2014. It is also validated through research that that the usage of patient portals will bring huge benefits with regards to patient safety and the secure exchange of healthcare information. Since introduction in October, 2011 the SMART Cloud has grown to over 25,000 practice users in just four months, making it the fastest growing cloud application for medical practices of all sizes. Having pioneered Cloud based EHR and practice management solution in the late 90s, CureMD healthcare announced SMART Cloud delivery at the MGMA in Las Vegas. The SMART Cloud is the All-in-One EMR which delivers all enterprise level features available in the package developed over the past fifteen years for pure web based experience. SMART Cloud provides practices with a limitless environment to perform every day clinical, administrative and financial functions without the cost and hassle of in-house technology, updates and support. “Fifteen years of R&D has helped make the SMART Cloud a bench mark for our industry. Thousands of CureMD community members have contributed in the evolution of this EMR – an innovative solution, comprising of rich features on every practice’s wish list.” said Bilal Hashmat, Co-founder and CIO at CureMD, “The creation of the SMART Cloud EMR is the fulfillment of our promise to deliver an adaptable, accessible and affordable solution for every provider. 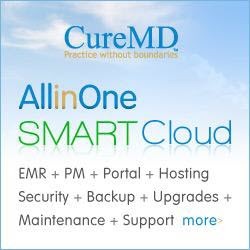 Hosting, training, security, back up, support and updates are all included along with certified EMR, PM, Portal and revenue cycle management, making CureMD SMART Cloud the most cost effective medical software solution available today. SMART Cloud is scalable for all practice sizes – solo to large multi-specialty, multi-location group practices. CureMD is an award winning health IT service offering SMART Cloud EMR, practice management, patient portal and revenue cycle management to help accelerate adoption and Meaningful Use – driving outcomes and subsidy payments to maximize value and returns. CureMD Healthcare has expanded its network to reach more practices across the nation by partnering with over 20 regional extension centers (RECs). More than 50,000 primary care providers now have the opportunity to utilize CureMD’s all-in-one EMR, PM and Patient Portal solution – a browser based, easy to use and affordable solution available via on-demand SaaS subscription and on premise (client hosted) models available through fast track implementation. This partnership allows CureMD member practices utilize REC support services to effortlessly transform into meaningful users and secure their share of the federal stimulus money. “We are pleased that CureMD’s award winning usability, browser based, all-in-one design, advanced features backed by extended configuration capabilities and most importantly our culture, processes and people have won us the trust of another Regional Extension Center.” said Bill Hashmat, CIO at CureMD. Regional extension center evaluations are based on numerous factors including company history, financial stability, industry experience, market penetration, solution capabilities, services provided, marketing and sales capabilities, implementation capabilities, industry partnerships, presence in individual state, client satisfaction levels, MU Strategy and compliance reporting, HIE, Interoperability and preferred pricing. CureMD solutions are usability driven, browser based, all-in-one, CCHIT 2012 and ONC-ATCB certified offering single source electronic health records (EHR), enterprise practice management (EPM) and patient portal (PP) to improve the quality and value of healthcare – optimizing the efficiency and profitability of practices. Thousands of providers nationwide turn to CureMD and drive outcomes and subsidy payments to maximize value and returns. Regional Extension Centers are funded by the Federal Department of Health and Human Services’ Office of the National Coordinator. Regional Extension Centers offer health care providers a local resource for technical assistance, guidance, consulting, education and information in support of acquiring electronic health records and accelerating the process by which health care providers become meaningful users of EHRs. NYC REACH, the federally designated Regional Extension Center (REC) for New York City overseen by the Primary Care Information Project at the NYC Health Department, has teamed up with CureMD Healthcare, the leading provider of web based EHR/PM and portal solutions, as a partner of choice to assist eligible health care providers in New York City to achieve Meaningful Use. “This partnership with CureMD will enable us to combine resources to best help NYC providers achieve Meaningful Use and use their EHR to improve patient care.” said Dr. Jesse Singer, Acting Assistant Commissioner for the Primary Care Information Project. NYC REACH provides technical assistance, guidance and information to health care providers seeking to implement EHR systems and achieve Meaningful Use as defined by the Centers for Medicare and Medicaid Services. In addition, NYC REACH facilitates the use of EHRs by providing classes, one-on-one site visits, and feedback on quality measures to help providers use EHR tools to prevent and manage chronic conditions. NYC REACH is federal designated regional extension center serving physicians in New York City. It was launched by the NYC Health Department’s Primary Care Information Project (PCIP), in partnership with the Fund for Public Health in New York (FPHNY). NYC REACH encourages health IT adoption in physician offices, community health centers, and hospitals to coordinate care and improve health outcomes, specifically through the use of prevention oriented EHRs. More information can be found at http://www.nycreach.org or by contacting pcip@health.nyc.gov or (347) 396-4888.The program evaluates vendors based on numerous factors including company history, financial stability, industry experience, market penetration, solution capabilities, marketing, sales and implementation capabilities, industry partnerships, client satisfaction, MU Strategy and compliance, HIE, and Interoperability. Regional Extension Centers are funded by the Federal Department of Health and Human Services’ Office of the National Coordinator. Regional Extension Centers offer health care providers a local resource for technical assistance, guidance, consulting, education and information in support of acquiring electronic health records and accelerating the process by which health care providers become meaningful users of EHRs. CureMD Healthcare is an award winning network of health information management systems and services offering certified EMR, practice management, patient portal, revenue cycle management and discrete reportable transcription to help accelerate adoption and Meaningful Use – driving outcomes and subsidy payments to maximize value and returns. CureMD’s advanced web technology and award winning usability facilitate quality decision making, streamline operations, and ensure compliance. CureMD Healthcare, the leading provider of EMR, PM and Portal Cloud, announced the launch of its HIE connectivity with one of largest hospital organizations of the nation, The Hospital Corporation of America (HCA). HCA is nation’s leading provider of healthcare services through locally managed facilities in 20 states and Great Britain and employs approximately 183,000 people. Based in Nashville, TN, HCA was founded in 1968 and is one of the nation’s first hospital companies. HCA currently operates 164 hospital and 106 Free Standing Ambulatory Care centers in 20 states as well as in Great Britain. Nearly five percent of all inpatient care delivered in the country today is provided by HCA facilities. The connectivity enables physicians associated with HCA facilities to conveniently exchange hospital based clinical and medical management information with CureMD’s Smart Cloud EMR, practice management and Portal. Consequently, providers deliver better care with all information at their fingertips. This technology supports the flow of health information between physician practices, hospitals, long term care facilities, labs, radiology centers, and other health care institutions. CureMD HIE connectivity allows delivery of the right health information to the right place at the right time, providing safer, more timely, efficient, patient-centered care. CureMD is an award winning network of health information management systems and services offering certified EHR, practice management, patient portal, revenue cycle management and discrete reportable transcription to help accelerate adoption and Meaningful Use – driving outcomes and subsidy payments to maximize value and returns. CureMD’s advanced web technology and award winning usability facilitate quality decision making, streamline operations, and ensure compliance.